Newest Model: 2019's SINGTRONIC KA-2500DSP Professional Digital 3.5" LCD Screen Karaoke Mixing Amplifier offers flexibility and power to make it perfect for a wide variety of applications. Singtronic KA-2500DSP is the best amplifier to karaoke enthusiast. It packs 2600W of power allowing you to get that deep bass you feel. Singtronic KA-2500DSP is also the world's first karaoke console mixing amplifier with a built-in 1300W + 1300W of hard hitting power, along with HDMI, Bluetooth, LCD screen, USB Recording & Playback and ect. Equipped with a BBE processor, music and vocals will come out with rich details heard in concerts. In addition, the exciting feature added is the DSP Digital Sound Processor which allows you to professionally fine tune your speakers, also built with rich professional console appearance. For further music enhancement, a music control panel was also installed. Adjustments to LOW/MID/HIGHS are a simple knob touch away. With all these amazing features, it guarantees each singer is sounding their best at every song! Newest Model: 2019 SINGTRONIC KTV-6000HD's the hottest product from Singtronic. The world's is first karaoke HDD player operates on Android operating system, so it has owned all features with respect to Android operating system. It is not only a HDD karaoke player with HDMI 1080P, but also a product which has transcended the limitations of players. Actually, it is an intelligent computer system. By enabling the unit to access to Internet, users can download and install various APK applications from Android application store. And it also provides interfaces to camera, mouse, keyboard and other peripherals to support Internet surfing, chat, e-mail, webpage view, television, news visit, HD movies, photos, music, games, remote monitoring, timing & reminding, as well as interaction with PC and mobile phone. Additionally, users can also make full use of their imagination to explore the potential of the unit as it is really a professional device integrating KTV, HD smart TV box, DVD Player and Android computer. Newest Model: 2019 SINGTRONIC KS-2500 is latest model of our polish painting piano-wood series especially designed to match with your home furnishing creating a grand atmosphere. Using the most advance in technology for karaoke speakers, the attention in details from our engineers like the use of 15mm MDF superior speaker cabinet material, high end crossover component and audiophile grade driver are phenomenal! the KS-2500 is an elegant Karaoke speaker with black MDF (medium density fiberboard) wood gloss layered finish. It has good sound quality and artistic beauty. The speaker was designed by using the principle that softer wood provides smoother and clearer audio output like a piano. The piano-wood series is especially designed for customers with a good sense of art and music. SINGTRONIC KS-2500 has high standard in sound definition producing maximum power and range with great stereo and booming bass feature. The new four tweeters for high frequency sounds allow crispy clear vocal unmatched by any karaoke speaker. 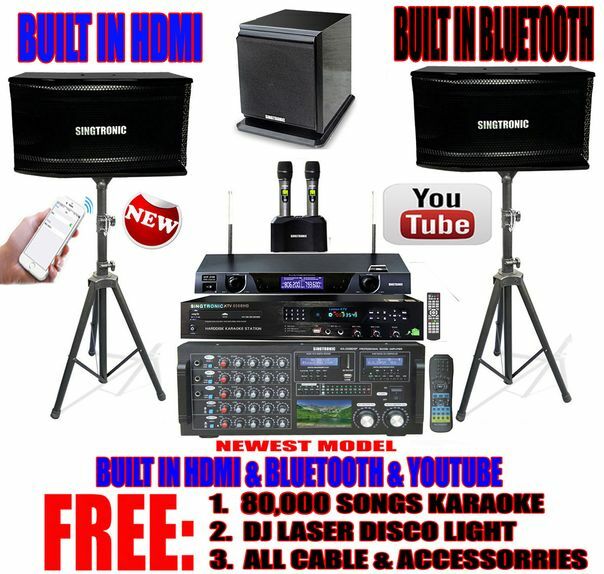 Newest Model: 2019 SINGTRONIC UHF-2500 Professional PLL Dual Rechargeable Wireless Microphone System is the right solution for Karaoke vocalists, Home Entertainment enthusiasts and Club Patrons who have been looking for a best effective UHF wireless solution that can fit seamlessly into a multitude of applications. Working on crowded group singers UHF frequency bands have develop it on signal, the UHF-2500 ensures the best possible performance for all singers. The world's first ever built with fine metalic handheld wireless microphone system with LCD display and separate based charger. BONUS SUPER BOOOOOOOOOM BASSSSSSSSSSS SINGTRONIC SW-350B Power Subwoofer Like its predecessor the SW-350B, the SW-350B was tested thoroughly, but this time in live Karaoke, as well as full-scale club environments, ensuring a solid performance in the Karaoke and club arenas. It’s small footprint design and recessed side-handles makes placement and relocation practical, and with it’s reinforced shell construction and aviation grade carpeting, it is well protected from the elements and attractive to the eye. You won’t have any trouble integrating the SW-350B, as it has both line-level and high-level connection options. Once you experience the full-spectrum sound that the SW-350B brings to a sound system, you won’t want to hear audio the “old” way ever again!